Philip Fulton set a goal for $12,000 – and ended up receiving $20,731 instead. Anna Kiraly and her family found her perfect home within 24 hours of setting a goal to do so. Before she moved, trying to sleep was a nightmare. Now, she sleeps like a baby! Donovan Watson set up the part-time manufacturing business he always wanted. Meanwhile, he kept the job he had and was pleasantly surprised to find he was getting a lot more respect and cooperation from his co-workers. These are only a few of the many success stories you will learn about on this Web page. More important, you will learn about the $5,950 SACP System that people used to CREATE these successes – and how, for the first time ever, you can reap its astounding benefits yourself, at a fraction of the price. The SACP System produces miraculous results. For the people who used it, this system has produced results like clockwork, with documented certainty, 100% of the time (yes, it really is hard to believe, but it’s documented). This was true when they completed all, or even just most, of the assigned work. 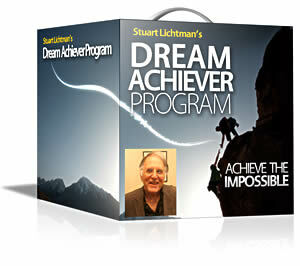 They used a scientifically-designed, spiritually-based goal achievement system (which is only part of the full SACP system, but an important part which is fully available to you today as the Dream Achiever System). To be blunt about it, because of the $5,950 cost -- the full SACP System has been out of reach for most people since it first came on the market in 2002. For a limited time, you will be able to get a new, affordable, easy to understand version of the system at a fraction of what others have paid. And you can try it out RISK FREE. Many years ago, I discovered a true “Secret.” A technique that never failed to achieve whatever goal I set out to achieve. Yes, that’s right. It worked every time I used it. ... even if everything you have tried before has disappointed you. In 2002, I wrote an ebook, along with downloadable audios and some bonus ebooks, to share what I had learned and taught around the world. I wanted to make my knowledge and system available in a home-study format. The book sold thousands upon thousands of copies. People reported amazing results – and not only with money. People lost weight. They got the exact home they had imagined. They found the love of their life. Dreams of all kinds came true. “Before, I was flat broke, working for a software company that was going under...because we had no sales for almost 2 years. I had to accept a 20% cut in pay so they could stay afloat and keep me on board. I support a family of four (and now one on the way), and we're having a hard time getting by on my salary alone. Then, when I read your book, at first I was unsure if I could use the it to really attract what I wanted effortlessly simply by following your instructions. But I did it anyway. What happened next will not only benefit me, but at least 4 other people who work with me. I was literally handed two deals totaling $1.1 million dollars. My commission on them will be over $100,000...and that was just the beginning. “My wife Brandy found the 'perfect' house, with plenty of space for the family AND a front and backyard (which is quite rare in California!). The problem. We needed to come up with a deposit. And we needed to do it in 3 days. “I downloaded 'How To Get Money for Anything Fast' around October 12th. By the end of the year - using your CT/SA process - I had put a closer to a very challenging 3 1/2 year relationship; found who I believe to be the love of my life and had a 400% increase in business over the same period from the year before! That’s just a small sample of the testimonials I received. The book was a hit. I got enough of those requests to develop an in-depth, whole-life interactive coaching program that became the SACP System. It costs $5,950. Many people signed up for it and got even more spectacular results; I’ll tell you about them shortly. I would tell them that the SACP System coaching program would solve their problem. But unfortunately, the $5,950 pricetag was too high for most of them. I knew – and they knew – that we needed something between the ebook and the coaching program. Because some people can’t learn my technique from books. And I want to make my training available to as many people as possible. It gives you everything you would get from the ebook, but in a form that is much easier for many people to learn from. You see, in the full SACP System, we give you detailed, step-by-step descriptions over the phone and using Webinar slides, to break everything down to small, simple steps. A lot of people learn better that way. Now, before we go further, I need to emphasize that the entire SACP system covers a LOT more than my proven method for achieving nearly any goal. But, if you took the goal-achievement portion alone, and took out the interactive coaching, then what you would have is the Dream Achiever Program. This is just what people have been looking for, for years. When the movie “The Secret” came out (it stars my co-author, Joe Vitale), it sparked a lot of controversy. Some people swear by it. Some people swear at it. :) I am going to give you probably the first scientific explanation – in very simple language – for why there are so many heated arguments about it. And, by the way, I’ll also tell you how you can “cash in” on the “The Secret” regardless of what you think of the movie. Can some people attract money (or anything else) just by visualizing it and snapping their fingers? Yes, there are people for whom it’s almost that simple. That is because of what is known as the Law of Attraction combined with something very personal and specific to them. It’s what I call “success power,” which they have available on command. It practically courses through their veins. But most people don’t have "success power"
However – and this is vitally important – I'm here to tell you that anyone can develop the ability to get the same kind of results. Maybe not as instantly. But certainly as reliably. Not only that. I have the one system on the planet that will show you how to do that. Step by step. You see, I have a track record of 41 years and more than 70,000 people I have helped improve their ability to... use whatever word you want... attract... create... generate... manifest... accomplish...GETwhat they want. “The Secret” was basically correct, but left out some important information about how the goal-achievement process works. What you saw in the movie was like a documentary about how average people pitch a baseball, but all the examples were All-Star Players and members of the Baseball Hall of Fame. Yes, my SACP system definitely works for superstars. Here’s what sets it apart from all other systems available: It ALSO works for anyone else, too. As long as you follow the step by step instructions – which, again, over 70,000 people have already done successfully. It gets the conscious and unconscious minds in complete alignment. In case you didn’t know, THAT’S HUGE. Because the main reason most other systems fail – or only work part of the time – is they allow conflicts to remain in the unconscious mind. Someone with highly developed success power can navigate the conflicts and achieve big things. (Although often at considerable personal cost – misery, heartbreak, broken relationships, health problems.) But most people can’t overcome unconscious obstacles at all. What does this look like for most people? For a goal achievement system to work consistently, it has to fully address the issue of aligning the conscious and unconscious minds – which means resolving unconscious obstacles. To Make Your Wildest Dreams Come True! My secret for aligning the different parts of the brain towards one common purpose involves a unique technique I developed called Cybernetic Transposition. Imagine you had a chariot drawn by 4 horses. Just one little problem: These are wild horses. They go wherever they want, whenever they want. They stop whenever they feel like it. In short, they are totally out of control. Sad to say, this is how the different parts of most people’s brains work when they try to accomplish something major. Now, instead, imagine you had 4 horses that are totally enthusiastic about cooperating with each other and together as a TEAM! You’d get where you want to with ease... on time, and you’d arrive happily, and in one piece. I gave you this analogy for a reason. People who know me well like to joke that I am “The Horse Whisperer” because my method gets these four “horses” to move together, powerfully and harmoniously. It’s an amusing phrase, but the core idea underneath it is 100% right. STEP 3: Resolve the roadblocks at both conscious and unconscious levels so there is nothing standing in the way of achieving your goal. (This is where almost all systems – and most people – fail big-time at really big goals. With the Dream Achiever Program, we have a method that removes roadblocks like a high-powered bulldozer – only much more gently, and agreeably! By comparison, most other methods are like push-brooms. They get the small obstacles out of the way, but they are no match for the really big, stubborn roadblocks – if the other methods help you with the big roadblocks at all. And it’s almost always those big roadblocks that stand between you and your realizing your dreams. “In Synch” And In Favor Of Achieving Your Goal? The short answer is – you achieve the goal! “The original objective I submitted was: ‘On or before December 20, 2006, with the full and highly effective participation of my Success Team, I will have done everything necessary and appropriate to generate $357,000... When all was said and done, I had exceeded the $357,000 by over $169,000 prior to the new End Point Date! “Since I’ve set my SACP8 Objective the following events have taken place in my Life. I’m sending this note with all Sincerity and True Personal Joy and Gratitude. 2. I received a pay raise in excess of $8,000 a year. 3. My Daughter received a Full Ride Soccer Scholarship to the University of Maryland. $140,000. 4. I got a contract on a pre-foreclosure Condo in Las Vegas. $30,000 under Market. 5. I've never felt better in all my Life! “I have gained so much from both SACP7 and SACP8 that the quality of my life has improved dramatically. Things (appointments, sales, meetings, parking spots, "to do" items...etc) happen very easily and effortlessly in my life on a daily basis now. I no longer struggle or force accomplishments/my daily activities; they unfold effortlessly. Before the SACP7, I had told myself for years that I was never good enough, smart enough, worthy enough of being loved. I concluded as a child that I was to blame for my parent's divorce and that it was my fault. I didn't feel deserving of love. I understand now that that was simply an incorrect conclusion. “My objective was to bring order to my household. This was not my first choice of objectives but I got very strong messages that I needed to focus on this before I could easily create anything else. I went to get my living room and dining room carpets cleaned - these carpets were left in the house by the previous owners when we bought it. The carpet cleaners informed me that they were hand made Chinese silk and worth about $30,000! While having a cash flow problem I got a call from an insurance co. that my father had bought life insurance for my kids. They phoned to let me know the policy was not as good a value as he thought it would be and an independent broker advised me to cash them in. Within days it put $4,000 in my bank account. While watching the Antiques Road Show they evaluated a cocoa pot and matching cups at about $30,000. I realized that my grandmother had left me an identical set to the one on TV. So I had wanted to set an objective of creating $24,000 but seem to have created $64,000 in cash and valuables anyway. There has been a huge shift in not only the orderliness of our home and my business. It has allowed me to spend virtually no time looking for things, I can relax and allow my systems of orderliness to do their thing, my relationships with my husband and children have improved substantially, the clutter has disappeared leaving clear space, our home now functions easily. “My SACP13 Objective has come true. I created myself this Perfect IT Job in Vancouver, Canada. Susan (whom I just enrolled in the SACP14) happens to be my perfect 10 boss in this Perfect 10 IT job. Currently we are very busy with starting this job and moving to Canada from Belgium. We found this great place to live on Galiano Island just off the coast by Vancouver. This place seems to be a part of Merel's (my wife’s) Objective coming true as well, but she will have to report about that herself. PART 1: The Cybernetic Transposition Multimedia Learning Program. The quantum leap improvement! These are brand-new recorded, narrated PowerPoint video recordings you can access online. In fact, the Multimedia Learning Program (MLP) gives you “the next best thing to being there” – all of the benefits and learning clarity of the goal-achievement portion of the full SACP System, except the live coaching portion. In the first PowerPoint Video, you get a description of the process you are about to learn. In the second one, I walk you through the process by doing it myself, using the same form you’ll be using yourself when you do it. And the third video is a session where I’ll guide you, step by step, through the process itself. You can learn to do it with my recorded guidance, using the printable forms I provide you. That’s all you need, because these MLP videos are truly the “keys to the kingdom” that open up goal achievement for you. They are the magic of the SACP System that allows it to succeed 100% of the time – while other goal achievement systems work only for some people... or some of the time... or only for certain kinds of goals... or not at all. PART 2: An expanded, updated version of the original ebook, "How to Get Lots Of Money For Anything – Fast! ", by myself and Joe Vitale. This explains the complete Cybernetic Transposition goal-achievement process in full detail. I’ve taken all the questions I’ve received over the last 8 years about the ebook and worked answers to those questions into new content. Chapters increased from 11 to 23; 397 pages in all. Includes a professionally produced audio book version that covers the complete ebook. BONUS #1: Audio Guides Through CT Processes. A series of six audios during which I lead you through performing key repeatedly used CT Processes. You can listen to the audio guides online, or download them for your iPod or other mp3 player. Also included: easy-to-use, printable forms.. BONUS #2: Proven Secrets for Making Huge Sums of Money in Your Own Business. I have run and consulted to more than 100 successful small businesses, and I've improved the odds for success in each one dramatically. How? By employing the same secrets you'll learn in this 79-page bonus ebook! It contains special information that's rare and practically unknown in the business world at large, but it's yours FREE as part of the SACP System! BONUS #3: How to Cut the Time it Takes You To Do Things in Half, Effortlessly. You'll laugh at cumbersome time-management techniques after you see how simple and effective my time-saving methods are. Little changes you can make easily in your everyday unconscious habits can free up tremendous amounts of time. You'll be amazed how well these techniques work! BONUS 4: ZAPPERS! A Simple, Proven Series Of Techniques You Can Use At A Moment's Notice To Turn Around Dicey Situations. Ever wish you had a quick fix to diffuse tension at a meeting? When it's time to make a decision, would you like to know how to become clear-headed right away? Want a simple way to become very calm and confident before you have to give a presentation? This special report gives you new techniques you can use immediately to get things working in your favor. Here's what this means to you: With this complete package, now you’ll be able to get your hands on a complete working set of steps to take you wherever you want to go – and finally, at a price you can afford! At a Shockingly LOW Introductory Price! As you may know, the full SACP System is priced at $5,950 because it includes a lot of interactive coaching processes besides the goal achievement system – and the full system includes other special materials as well. The Dream Achiever Program, of course, includes all the detailed, “take you by the hand” step by step instruction in each part of the Cybernetic Transposition 3-step Goal Achievement Process – and the CT 3-Step makes up about 40% of the full SACP. Do the math – 40% of $5,950 is about $2,400. So that’s where I would set the value of the Dream Achiever Program. Except for one thing. There’s no interactive coaching with the Dream Achiever Program. In the full SACP, the coaching portion is worth 50% of the fee. 50% times $2,400 = $1,200. So, that sets the value of $1,200 for the Dream Achiever Program. And that's the price my marketing advisors recommended. Note that time payments are also available. Note this option after you select Add To Cart. If for any reason you are not satisfied with the Dream Achiever Program for up to 60 days after your purchase, simply let my customer service department know. And you’ll receive a prompt, courteous refund. So if you’re even thinking you might want this, let me urge you to act now! Remember, you are fully protected by the 60-day guarantee. And this is the one opportunity you’ve been waiting for. P.S. One of my team members pointed out something really interesting in a staff meeting the other day. He said that other goal-achievement teachers keep coming out with new products, techniques and gimmicks all the time. With appreciation, I think that says it better than I could say it myself.